Hello people, I was wondering what options are out there for third party lenses that'll be good for astrophotography, or any vintage lenses. Thanks! What kind, wide field or deep sky objects? Just did a little messing around last night with the Tamron 70-200 f/2.8, the Sigma 12-24 f/4.5-5.6 and Sigma 24-70 f/2.8 HSM are good, and the Pentax F 50 f/1.7 was great for it. The DFA 150-450 is awesome for it, and the Sigma 150-500 was acceptable. The Sigma 18-35 f/1.8 ART is excellent for it too. You're looking for fast lenses in general when it comes to astro work. I've used the SMC Tak 200mm to amazing effect with my K-3 and O-GPS1. If you're wanting a wider lens then one of the Samyang/Rokinon fast wide lenses should be great with little distortion. If you want a bit of an all rounder then I suggest getting a used Samyang 85mm f/1.4 lens. Images taken at f/2.8 will resolve tons and tons of detail with very little coma or aberrations. I just took a look at the Sigma 18-35mm. I'll probably buy that one later on down the road. Are the optics any better on the ART version than the old one? Didn't think there was an old version, Derouin. Are you thinking of the Sigma 30mm? Yes. My bad, I was looking at a lot of different lenses. The old version was a full frame f/3.5-4.5 and isn't even close in optical quality to the ART version. The ART version is a constant f/1.8 and incredibly sharp. The ART is the one you want, no, need for wide field stuff on APSC. I know nothing of all this cleverness, I'll just say welcome to the forum. Here's an image taken with the Tak 200/4. 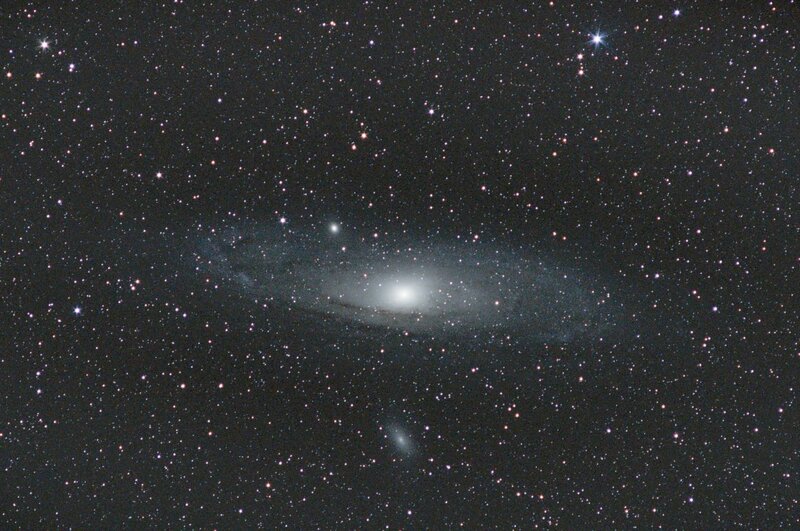 It's of Andromeda, and consists of around 15-20 images of 30 seconds each at f/5.6 and ISO 800 or 1600. These were stacked, then processed in PixInsight. Cool, thanks for such a quick reply to a one year old thread! I saw the notification pop up as I browsed and just had to respond - it's more than worth the effort to get out there and do astro! I live near a large city (UK, West Yorkshire) so I had the huge issue of light pollution. I can imagine it'll be the same for you too unless you can get out away from major towns and cities. It shows itself as a brightening of the sky, limiting the exposures you can make. Stacking allows us to gather the star information and reduce the effects of the LP.